Miguel Cotto: Back with a bang and ready, willing and able for some more sizzling super-fights! 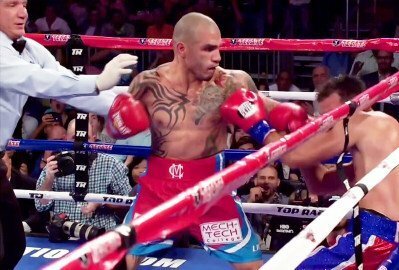 Puerto Rican legend and future Hall of Famer Miguel Cotto put two successive points losses behind him last night in blitzing a usually sturdy Delvin Rodriguez, in the process setting himself up for further massive fights. Cotto, now working with the great Freddie Roach, looked like a beast last night: strong, fast, powerful and full of energy, Cotto absolutely ruined a good fighter. Okay, some critics have commented how Rodriguez is and never has been on Cotto’s level and that Cotto’s win was expected. But that is doing both fighters a disservice. Cotto showed he still has the stuff to intimidate and overwhelm a fighter who has hung tough in a number of wars in the past and not too many experts were predicting as quick a victory as the one Cotto emerged with. Looking fresh and darn close to back to his best, Cotto now has a ton of options. This one has been spoken of before and Martinez has reportedly expressed an interest in meeting Cotto at a catch-weight. This one would be massive. Imagine the atmosphere inside a packed out Madison Square Garden! Another fight that has been a possibility for some time. The young lion, attempting to bounce back after his humbling loss to the incomparable (in this era) Floyd Mayweather Junior, going up against the old (but refreshed and still hugely motivated/hungry/formidable) lion. This one, in light of both men’s recent outings, has the distinct look of a pick ’em fight. Could this one happen? Should it happen? You know for darn sure you’d pay to watch it if it did happen. Is Golovkin as great as many people say, or could veteran master Cotto reach deep into his bag of skills and shock the odds and take away the hugely powerful puncher’s perfect record? Even as a catch-weight non-title fight this one would be red-hot. Cotto Vs. Floyd Mayweather II. A long shot maybe, but in light of how well Cotto acquitted himself against “Money” back in May of last year (bloodying Floyd’s nose and even managing to win three, maybe four rounds in the opinion of some), maybe a return would sell. And Mayweather is fast running out of pay-per-view-worthy opposition. Cotto is up for a sequel, maybe Mayweather will be too? Next boxing news: Should Wladimir Klitschko been disqualified for holding against Povetkin? You are here: Home / Boxing News / Miguel Cotto: Back with a bang and ready, willing and able for some more sizzling super-fights!